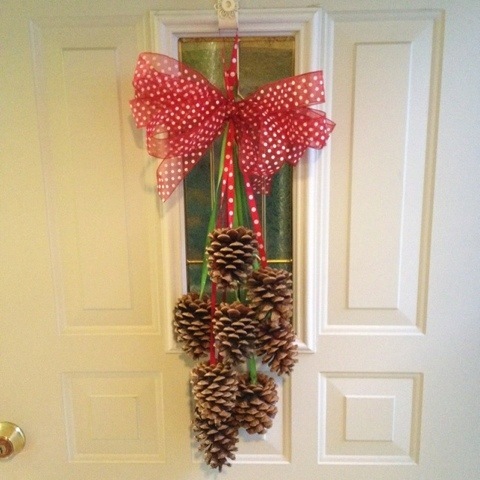 Pine cones and ribbon make a beautiful holiday decoration for the front door. Use hot glue to attach the ribbon to the pine cones. I wrapped the ribbon around the stems. Once you have attached your first pine cone cut the ribbon a foot and a half to two feet long then attach a pine cone to the other end. I made four of these then tied them together at the top leaving a loop of ribbon to act as the hook. Then simply attach the bow to the top. Me too! I love the simplicity of it. Really you could have one on your door anytime of year. The cheapness factor is also really nice. It could be a fun family activity to take the kids outside somewhere to collect pinecones to make decorations for the house!